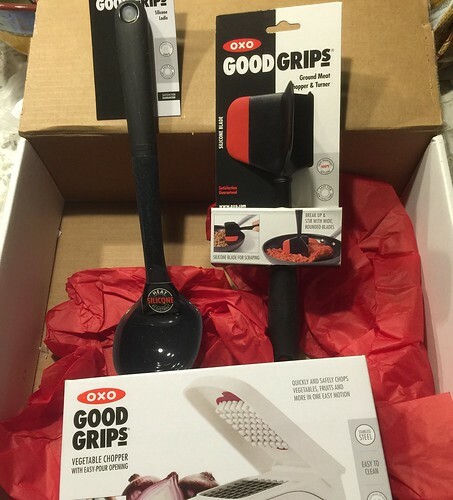 Disclosure: OXO sent me free products, in exchange for a fair and honest review. All opinions are 100% my own. Since we moved to the new house, we have been using the kitchen quite a bit. Honestly, the kitchen is what made me fall for the floor plan, so of course, I was going to go a little crazy. After a couple of weeks, however, we were definitely missing our old vented kitchen. So, we had someone come out and take care of venting the kitchen for us. Vegetable Chopper with Easy-Pour Opening. 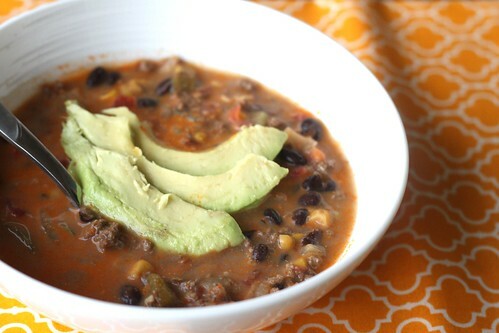 I decided to make a spicy chipotle taco soup the other night. After having a smoky tortilla soup at a local tex-mex place, I so wanted to replicate the broth as closely as I could. One thing I didn’t expect was for H to love it as much as he did. He’s usually adding more spices to whatever I make, and I’m pretty sure he didn’t add anything to this soup! I will mention that this soup is pretty darn spicy, so I added some avocado slices to my bowl to help with the heat from this soup. If you don’t want it to be very spicy, you can use less chipotle peppers (or remove the seeds) or use a milder Rotel in the recipe (I used original). I also wanted to mention that while it’s delicious the day you make it, it’s even MORE flavorful the next day. Look at how hearty this soup is! I have to admit, this recipe is pretty darn quick to throw together. 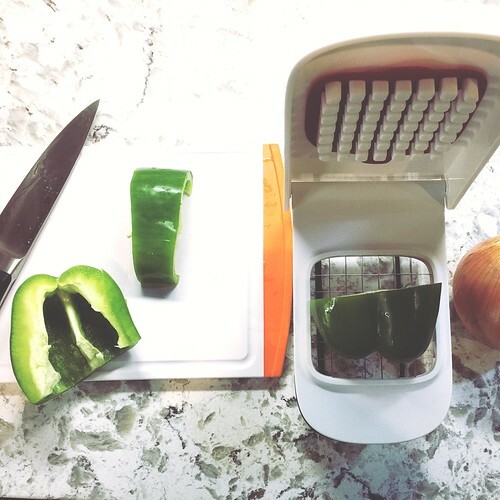 Prep was very easy, thanks to the OXO Vegetable chopper. Chopping the onion and bell pepper was a breeze! Also, I was surprised at how helpful the OXO Ground Meat Chopper was. I’m used to chopping things up with a spatula, but this made the meat break up so easily and quickly. I think this recipe is perfect for weeknight cooking. You don’t have to prep too much, and a good bit of the ingredients involve cans of vegetables to add into the recipe. So simple and super delicious! In a large, heavy stockpot (at least 5 quarts in size) over medium-high heat, brown the lean ground beef until it’s fully cooked. Add in the chopped onion and bell pepper, cooking until the onions are translucent. Reduce the heat to medium. Then, add in the cumin, smoked paprika, salt, garlic cloves, chipotle pepper and adobo sauce, and stir/cook for about another minute, until fragrant. Add in the Rotel, yellow corn, black beans and chicken stock. Stir and reduce the heat to a simmer. Once it reaches a simmer, place the lid on the pot, and allow the soup to simmer for 20-30 minutes. When the soup has finished simmering, slowly pour and mix in the heavy cream. Enjoy! Disclosure: I received samples from Swanson® for review purposes, as well as soup dinnerware/serveware for this post. All opinions are completely my own, based on my experience. Swanson also provided the prize for this giveaway. Just a couple of days ago, my husband and I started looking into redoing some aspects of our kitchen. Well, it’s been on the backburner for quite some time, but we seriously looked for the first time this past week. While I love our current house, I’ve always drooled over gorgeous granite countertops in other homes. I highly doubt we’ll have granite in our kitchen before the holiday season, but hey, it will be soon enough! With the holiday season growing near, we’re finally feeling weather in the 40s (and sometimes, even 30s) here in south Louisiana. Since then, I’ve been craving a lot more soup than usual. 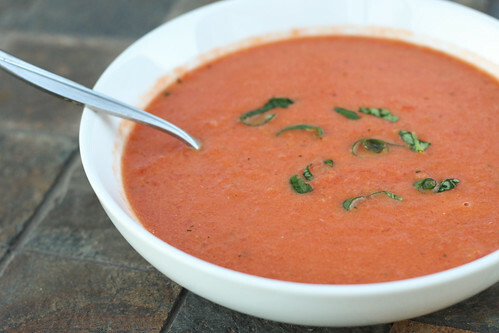 After I had some dental work done last month, all that really sounded good was tomato soup (I’m pretty sure I had it 3 times that week), and I wanted to make a big pot of it ever since! I just can’t shake the craving! The folks at Swanson reached out to me, and asked me if I’d like to try out their new products. I’m a big fan of Swanson broths, so of course, I couldn’t say no! For the new products, I was sent their new cream starters, as well as the Louisiana Cajun and Tuscan Chicken flavor infused broths. Right now, we’re in the middle of crawfish season in Louisiana. Whenever my husband and I are invited to a crawfish boil, we make sure to clear our schedule. The crawfish, corn, potatoes, garlic, sausage, ::insert whatever vegetables are in the fridge::…it’s just all SO good. Some people may say it’s quite a bit of work/peeling for a tiny crawfish tail, but once you get the hang of it, it’s not so bad. It can be a bit messy, which is why most people enjoy the food outside with layers of newspaper and garbage bags lining the table. And usually…there’s always leftovers! I love leftover potatoes and corn…and peeling the rest of the crawfish for dishes the next day isn’t so bad either. The last boil we had with my husband’s family, I made this soup the next day, along with some mini crawfish pies (that recipe is coming later). It was a weekend-long feast! 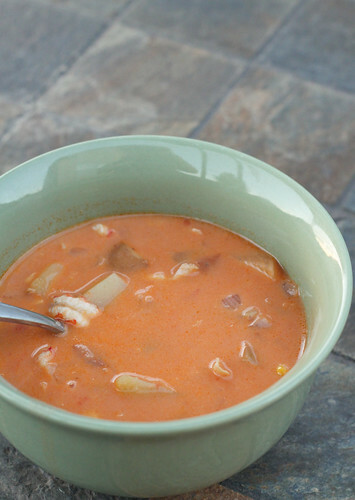 This soup is perfect for those leftovers from the boil. While I didn’t add any, you could definitely add in some of the leftover boiled sausage as well. This recipe is versatile, and if you can’t eat it all, it freezes well too! You may notice that there’s no extra spices in this recipe, and that’s because the leftover boiled vegetables/meat have plenty of it as it is. It will cook into the broth, and I found it to still be pretty darn spicy. However, if you taste it at the end and feel that it still needs a little something, feel free to add in some cayenne pepper and/or salt. Melt the butter and oil in a dutch oven over medium heat. Add the onions, and cook them until translucent (about 5 minutes). Add in the corn and potatoes, and cook the vegetables, stirring constantly, until the vegetables start to lightly brown (about 8 minutes). Add in the sausage/crawfish (if you have any), crushed tomatoes and chicken broth. Bring the soup to a gentle boil, and reduce the heat to medium-low. 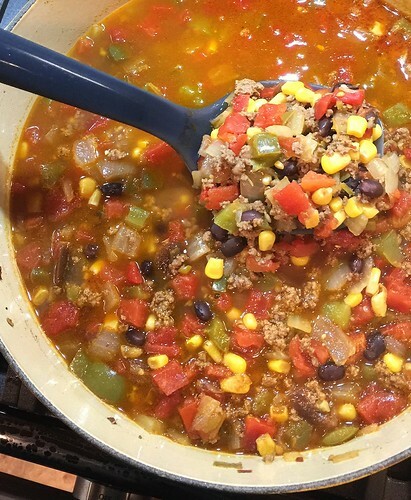 Simmer the soup for 30-40 minutes to allow the leftover boil flavors to develop into the soup. Stir in the heavy cream at the end, and enjoy! With the holiday season just around the corner, time with family and friends is so important. The holidays can be very hectic, between the shopping and party planning, but if you can save some time on the day to day tasks (like cooking for your family/cleaning up afterwards), you can definitely etch out some time with your loved ones. Calphalon sent me their new panini pan, as well as their 8 quart multi-pot with steamer to use for some time-saving recipes. I used their panini pan to make a chicken panini, using leftover roasted chicken, and I used the multi-pot to make a chicken tortilla soup. This past Christmas, my Mom and Dad generously gifted us with an electric pressure cooker. I opened it, and quickly imagined a pressure cooker explosion in my kitchen. I’ve always heard that pressure cooking can be dangerous, so I was pretty worried about using this. However, I did a little research, and they make pressure cookers a lot safer nowadays. Thankfully. It took me a while to finally break this bad boy in, but after the St. Patrick’s Day parade, we found our fridge FULL of vegetables that we caught that afternoon (What? They don’t throw vegetables at your St. Paddy’s Day parade?!). With all of these root veggies, I just had to make beef stew, and I figured why not try the pressure cooker for this? I did a quick search for pressure cooker beef stew, and this Williams Sonoma recipe caught my eye. 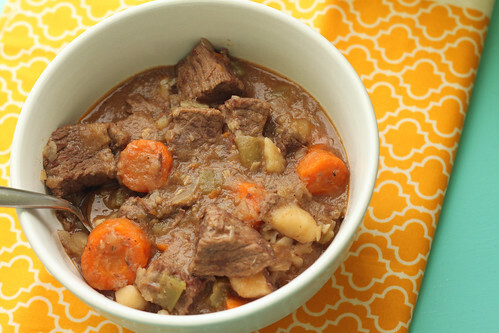 20 minute beef stew? HOW?! My husband and I were skeptical. In fact, we had our Le Creuset at the ready in case the meat was too tough/not cooked. I just didn’t think this would work, y’all. However, after 20 minutes of pressurized cooking (I say pressurized, because you have to wait for the appliance to reach the right pressure before the timer counts down, which took about 15 extra minutes), we had the most tender, flavorful beef stew. I’m a believer. We definitely need to use this appliance more often! In a large bowl, add the beef and toss it with the flour, salt and pepper to coat the beef evenly. Put your electric pressure cooker on the “brown” setting, and add the olive oil as the cooker is warming up. Add the beef in batches and brown the beef pieces on all sides, for about 3-4 minutes. 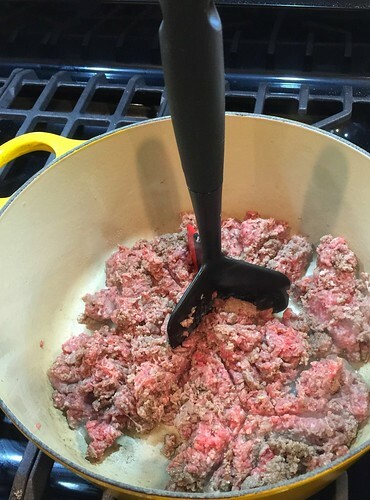 Transfer the browned beef to a bowl, and repeat until all of the beef is browned. Change the setting on the pressure cooker to “simmer” and add the red wine, stirring to scrape up the browned bits of meat. Once your finished, add the beef back in, along with the chopped onion, garlic, carrots, celery, potatoes, tomato paste, stock and thyme. Stir everything together to combine. Cover the pressure cooker (and seal), change the setting to “high pressure”and set the timer to 20 minutes on the cooker (do not use a kitchen timer…it’s crucial to use the timer on your appliance since the timer starts when it reaches the desired pressure to cook). Release the pressure naturally (which takes another 10-20 minutes, depending on your appliance), and then uncover. If you would like the liquid to be thicker, you can transfer the beef and vegetables to another bowl, set the pressure cooker to the “brown” setting and cook the liquid down until it’s reduced to the consistency that you want. Add the beef and vegetables back in, and serve immediately. Enjoy! Like so many food bloggers, I watched Julie and Julia. I will admit, as a child, I hated when my mom watched Julia Child. I couldn’t understand a word she was saying, and heck, there was Nickelodeon to watch! After watching this movie, I was inspired and knew I had to make this dish. I’ve been making it for a while now, but one of my blogger friends asked me to make this and show it step-by-step. Please realize that there is NO natural light in my kitchen, just in the dining area, so I did my best on the step-by step pictures! I used a version found on Joelen’s Culinary Adventures, because it was done in steps, which made it way easier! Thanks Joelen! Oh, and yes, this stuff is amazing. If you have time and a devoted dish washer (yes, this uses a LOT of dishes), definitely make this! Sauté the bacon in a dutch oven (no oil) over moderate heat for 2 to 3 minutes to brown lightly. (The bacon will render and give off enough fat to cook with.) Remove the bacon from the pot and place in a bowl; set aside. Dry the stewing beef in paper towels – it will not brown if it is damp. Add the beef, a few pieces at a time, to the dutch oven to cook in the rendered bacon fat. Sauté until nicely browned on all sides. Remove the beef from the pot and add it to the bacon in the bowl; set aside. If the bacon fat has been absorbed by sauteing the beef at this point, feel free to add 1 tablespoon of olive oil. In the pot, brown the carrots and onions. Return the beef and bacon to the pot and toss with the salt and pepper. Sprinkle on the flour over the meat in the pot and toss everything in the pot to coat the beef lightly with the flour. On the stovetop, heat the pot for about 2-3 minutes to lightly cook off some of the flour. To the pot, stir in the wine along with the stock or bouillon so that the meat is barely covered. Add the tomato paste, garlic, thyme and bay leaf. Bring to simmer on top of the stove. Then cover the pot and set in lower third of preheated oven. Allow the pot to braise very slowly for 2 1/2 to 3 hours. The meat is done when a fork pierces it easily. For the onions – place the peeled onions in a skillet with the butter and sear them until they start to brown, move to a medium saucepan, adding the wine, water and herbs. Saute on low for 30 minutes. Set aside to cool. For the mushrooms – place butter in the same skillet used to prepare the onions. Saute the mushrooms in the butter until they start to brown. Remove from the skillet and set them aside to cool. After the meat is braised in the oven or brought back up to temperature on a stovetop, remove and strain the beef and vegetables from the pot with a slotted spoon and place in a large bowl; set aside. With the remaining sauce left in the pot, allow it to simmer. You should have about 2 1/2 cups of sauce thick enough to coat a spoon lightly. If the sauce is too thin, boil it down rapidly to reduce and thicken. If it’s too thick, mix in a few tablespoons of stock or canned bouillon. Taste carefully for seasoning. At this point, return the beef and vegetables to the thickened sauce, along with the caramelized pearl onions and mushrooms. Gently heat everything over a medium low heat and then serve with egg noodles, rice or potatoes. Garnish with chopped parsley. I hope everyone had an awesome Halloween! I can’t believe we are already less than a month away from Thanksgiving. Since the weather’s changing, I asked my husband if he was up for a soup. I already had a recipe in mind, after seeing it on Dinner Delish. It sounded like a new way to use up chicken, besides grilling or baking it, and it was, most importantly, SKINNY! 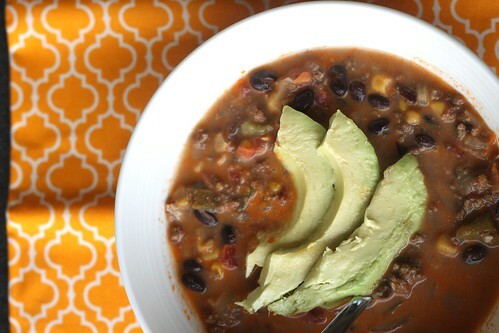 This soup definitely did not taste skinny, and my husband and I gobbled it up! It was delicious and not too hard to put together either! Cook bacon in a Dutch oven coated with cooking spray over medium-high heat until crisp. Remove bacon from pan. Crumble; set aside. Add chicken, onion, bell pepper, and garlic to bacon fat in pan; sauté 5 minutes. Add broth and potatoes; bring to boil. Cover, reduce heat, and simmer 20 minutes or until potatoes are tender. Add corn; stir well. Place flour in a bowl. Gradually add milk, stirring with a whisk until blended; add to soup. Cook over medium heat 15 minutes or until thick, stirring frequently. Stir in cheese, salt, and pepper. Top with crumbled bacon. Other weird things (at least that I know of) that we like to say…. If I’m going to a Mardi Gras parade, trying to find someone, you either stand on the neutral ground side or the shoulder side of the street. Every year, you get a sticker to check your brake lights, blinkers, etc. This, to people from the NOLA area, is a brake tag folks. You’ll sometimes hear someone greet another person…whatcha doin’ der sha? Seriously..don’t judge us. Now, don’t let our vocabulary deter you from trying a bowl of this amazingness. Gumbo (yes, I’ll be normal for the rest of this blog entry) isn’t too crazy. It’s basically a smokey stew of chicken/sausage or seafood on rice. If you want to be adventurous, you can add frog legs or alligator, but folks, I’ll keep this simple. The base of most cajun dishes is a good, dark roux. I will admit, this being my first time, I was very intimidated of burning the roux. Burnt roux isn’t good in gumbo. So, after watching my favorite Food Network chef, Alton Brown, try to master gumbo, I decided to use some parts of his recipe to help me out. His method? Oven baked roux….perfection, right? It worked out really really well for us. Oh yeah and my hubs gave a HUGE helping hand during this. There is a lot going on at once, and since I’m new to cooking, I don’t think I could have done it alone. However, in the recipe, it only makes 5 qts. of gumbo. I would like to say that in Louisiana, just making a 5 qt. pot of gumbo is not only shameful, it’s downright rude…hehe. 🙂 When making gumbo, you invite people over and 5 qts. just won’t make the cajun appetite very happy at all. So, we doubled the recipe and made HEAVY changes to it. I present to you – chicken, andouille, sausage and crab gumbo. Place the vegetable oil and flour into a 5 to 6-quart cast iron Dutch oven and whisk together to combine. Place on the middle shelf of the oven, uncovered, and bake for 1 1/2 hours (or until dark brown/brick colored), whisking 2 to 3 times throughout the cooking process. After the roux bakes for 30 minutes, cut up the chicken breasts into small chunks. Place the chicken in a pot (at least 12 qts.) with a gallon of water and the bouillon cubes. Bring to a boil and reduce heat a little to simmer for 1 hour. Once the roux is done, carefully remove it from the oven and set over medium-high heat. Gently add the onions, celery, green peppers and garlic and cook, moving constantly for 7 to 8 minutes or until the onions begin to turn translucent. Add the salt, black pepper, thyme, basil, cayenne pepper, and bay leaves and stir to combine. Place the mixture in the 12 qt. pot with the chicken, stirring to avoid clumps of roux in the gumbo. Add sausage and andouille. Decrease the heat to low, cover and cook for 25-35 minutes, until the sausage looks done and the chicken shreds easily. Turn off the heat, add the crabs to combine. Add the file powder while stirring constantly. Cover and allow to sit for 10-15 minutes prior to serving. Serve over rice. I was searching for the perfect beef stew recipe, and was pointed out to this recipe by someone on the What’s Cooking board that I frequent. I have to thank her so much for pointing me to this recipe because I would have never made it or known to search for it. 🙂 This was a wonderful recipe! FI went for seconds and he RARELY does that for anything I cook! I guess my skills are growing! Heat olive oil in a small Dutch oven over low heat. Add garlic to pan; cook for 5 minutes or until garlic is fragrant, stirring occasionally. Remove garlic with a slotted spoon; set aside. Increase heat to medium-high. Add beef to pan. Sprinkle beef with 1/2 teaspoon salt and 1/4 teaspoon black pepper. Cook 5 minutes, browning on all sides. Remove beef from pan. Add wine to pan, and bring to a boil, scraping pan to loosen browned bits. Add garlic, beef, remaining 1 teaspoon salt, remaining 1/4 teaspoon pepper, carrot, and next 8 ingredients (through bay leaf) to pan; bring to a boil. Cover and bake at 300° for 2 1/2 hours or until beef is tender. Discard bay leaf. Serve over noodles. Garnish with chopped fresh thyme, if desired.